The iconic AAMCO franchise is fortunate to have several successful married couples working as franchisees. It’s often said that couples make up for each other’s weak spots, making each other stronger in the process. In the case of Stacey Kujawa and Julie Lento, a married couple who own the thriving AAMCO franchise in Rancho Cucamonga, CA., it’s their conscious effort to run a business with integrity that fuels their drive. Stacey and Julie come as many married couples do, with unique skill-sets and professional backgrounds. 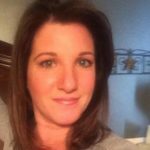 Stacey worked for a number of auto dealerships, as well as in the insurance industry with Aflac, while Julie spent spent several years working in real estate. 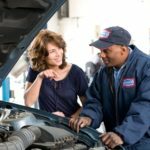 Though the pair always wanted to own a business, it was only until Stacey worked as a customer service manager in a nearby AAMCO franchise that the business model clicked. When the opportunity to buy an AAMCO franchise came up, Stacey and Julie jumped at the prospect. Julie was especially adamant about paying close attention to their women customers, and sought to make them feel comfortable from the get-go. The couple services about 50 cars on a weekly basis, and a growing number of their clients are referrals. Their overall business has steadily grown over the years as a result of their commitment to exceptional customer service. To ensure that their customers are trying with high standards, Stacey and Julie stress the importance of hiring technicians who share your values. Stacey and Julie have owned their AAMCO franchise for nearly eight years. 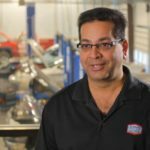 In that time, AAMCO has made significant strides in becoming an industry leading brand that is focused on increasing the level of profitability AAMCO owners experience in their stores. AAMCO is currently rolling out a new comprehensive Point of Sale (POS) system, which will improve our business model by providing the ability to create estimates and invoices for customers much more quickly and easily, driving revenue for franchisees in their centers. 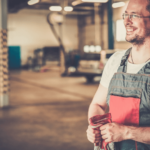 In addition, AAMCO recently a new consumer financing platform to help alleviate the financial burden of expensive car repair, while increasing the potential for sales for our franchisees. As Stacey prepare to open a new AAMCO franchise about 100 miles aways from their current store, the couple has some thoughts for married couples who want to go into business together.